Training for the RAF - The new multi-storey office block, completed in 1933, soon found itself involved in a very unusual, but, as later events would prove, important, activity. 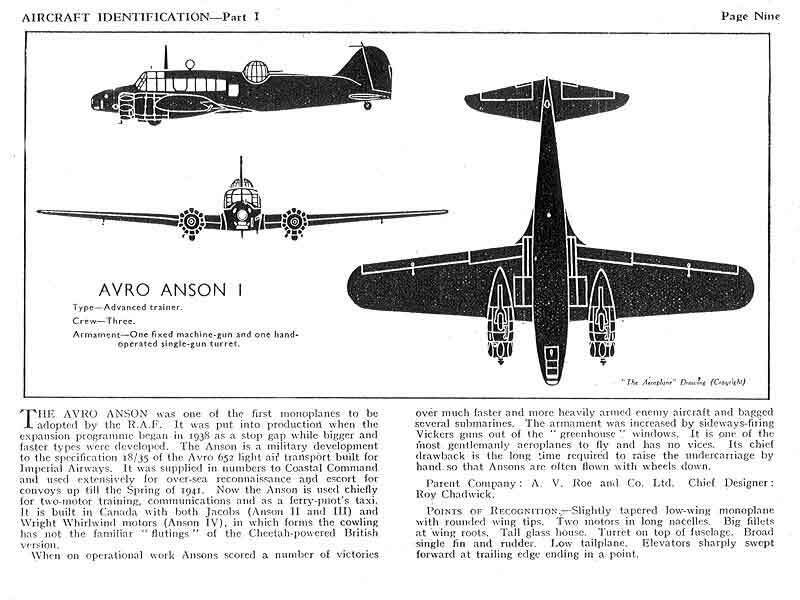 Having a large expanse of flat roof and being an obvious landmark, the Air Ministry commandeered the building in April 1934 for use in the annual week-long tactical exercises of the RAF Bombing Squadrons as part of navigation exercises to unfamiliar targets. A camera obscura formed from a tent with a lens in the roof was installed on the top of the multi-storey office block and used to plot the path of a puff of smoke released by an aircraft. This aided the plotting of the speed and direction of the wind - essential when determining the potential trajectory of a falling bomb. At night, white lights, fitted to the aircraft and flashed at the appropriate time, were used instead of smoke. Flares on the Works roof identified it to the aircraft during the night hours. This led to a number of calls being received at the Works from people who were convinced that the factory was on fire. The start of hostilities - At a series of meetings at the end of August/early September 1939, Josh Booth discussed with the Machine Shop Committee the Instructions that he had received from the War Office. He impressed upon the men that all instructions had to be followed to the letter "or we will be shut down". This applied particularly to the need to camouflage all buildings and to obliterate all lights. The Black-out - As a temporary measure it was proposed to blacken all roof lights on the outside with matt black paint - if darkened on the inside with ordinary paint the glass on the outside would still reflect moonlight. This meant that work would have to be carried out, day and night, in artificial light. It was hoped that some kind of shuttering could be fitted on the roofs that could be closed at night but open in the daytime. Special arrangements had to be made above the electric welding bays and over the cupola in the Foundry. Bert Slater tells us that shuttering was in fact fitted to the outside of the Shop roofs. In the Machine Shop at least, half of each section of glass was obscured with paint and the other half had a shutter that was pulled over at night. This allowed work to carry on in some degree of daylight. It is understood that these shutters - operated manually at first, were mechanised later in the War. Evacuation: There was much discussion about evacuation in the event of an Air Raid. Some men were reluctant to leave their workplace and go into the Air Raid Shelters - they considered them dank and complained of foul air when the doors were shut. Josh Booth was of the opinion that - " 150 men can be in these dugouts for ten hours with the doors closed without any more discomfort than getting hot and dirty". (For the siting of the Air Raid Shelters see "Air Raid Shelters" below). The presence of gas would be signalled by the sound of a football-type rattle and the doors to the Shelters could remain open until this warning was heard. The Air Raid Shelters were to be equipped with "lighting, First Aid equipment and a gramophone (!)". 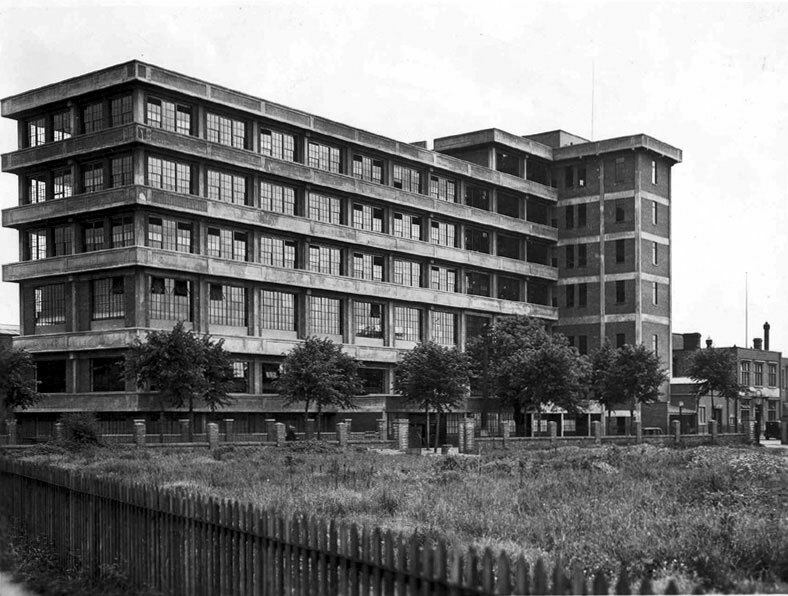 The ARP: Baker Perkins moved quickly to put in place ARP facilities at Westwood, spending a considerable amount of money on air-raid protection for its employees, including stores, a fully-fitted ambulance room and a decontamination room as well as enough air-raid shelters for 2,500 people. The ambulance room was fitted with a gas filtration pump for use in the event of a gas attack. The new Works Fire Station had been built and 48 firemen recruited and trained (See also The Baker Perkins Fire Brigade). There were now 80 members of the Westwood Works division of the St. John Ambulance Brigade plus a number of women first aid workers. (See also First Aid and St John Ambulance). The Company also built gas attack simulation chambers and an incendiary bomb training building. As with so many other aspects of the business, in the matter of providing for their employees, Baker Perkins were well in advance of many other businesses. The ARP Control Room was situated on top of the office block where messages and warnings were received and from where orders were issued. Mr D.Y.B. Tanqueray was appointed ARP Director with T.W. Blake as chief instructor. The Internal Call Sign (buzzer) that had been used to indicate that someone was needed on the internal telephone was commandeered as a first warning to alert the Wardens to the possibility of an Air Raid, in the event of which sirens and bells would be sounded. Each section of the Works was allotted a specific Shelter with a Senior ARP Warden detailed to each. Fourteen Senior Wardens were appointed at first but later, when more of the Shop men and Works Office personnel became qualified, one of each particular Department's men was put in charge of its own Shelter. The death of Mr. D.Y.B. (David) Tanqueray was announced in 1943. He had been in charge of the Materials Control Unit, set up at Westwood at the beginning of the war to ensure the supply of materials to the Works. So successful had he been in this task that the Ministry of Supply requested his services, appointing him as Deputy Director of Weapon Production. He soon had that department running smoothly and, towards the end of 1943, was allowed to return to Peterborough. Unfortunately, his strenuous efforts had undermined his health and he died shortly after. 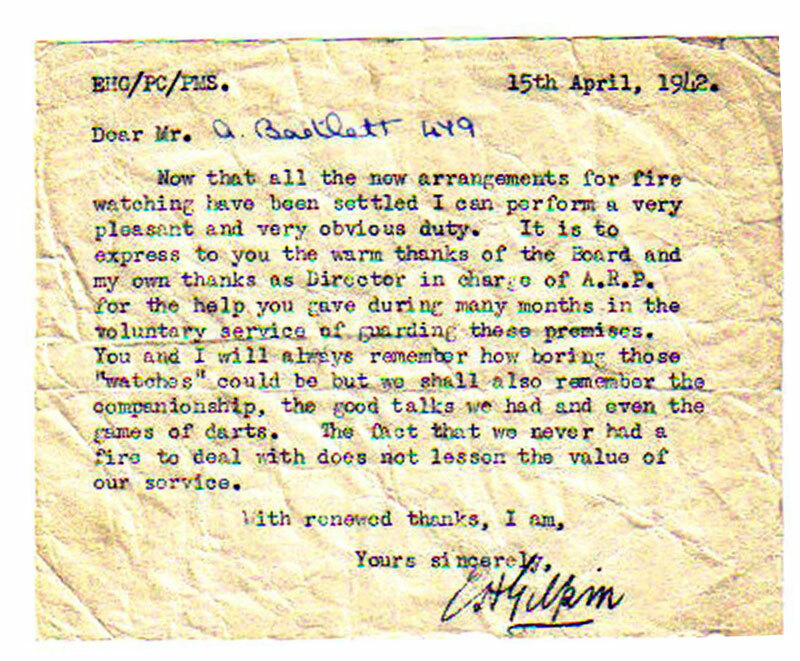 His responsibilities as ARP Director were taken over by anther Westwood Director - E.H. Gilpin - as evidenced by this letter of thanks to Mr A. Bartlett for services rendered as a fire watcher. Fire Watchers: The Company was instructed by the War Office to appoint Fire Watchers in anticipation of Incendiary Bombs falling through the glass roofs. A law passed in September 1940 required factories and businesses to also appoint employees to watch for incendiary bombs outside of working hours. Fire Watchers were issued with a bucket of sand, a bucket of water and a stirrup pump. There was to be a series of little "hide-outs" or "forts" built about the Shops and Foundry. These were to be manned by three men plus a Foreman - all trained in the use of a Stirrup Pump. In the event of an attack, the Fire Watchers would leave the "fort" and render the bomb harmless before a fire could start. (Following discussions with ex-employees who were at Westwood during the War, we wonder whether these "forts" turned out to be not much more than a hook on the wall on which a stirrup pump was hung). Incendiary bombs were quite small. They were dropped, hundreds at a time. On impact they ignited and burned. In the event of an attack, the Fire Watchers would leave the "fort" and render the bomb harmless before a fire could start. Fire Watchers were volunteers and they would go to their "fort" should the alarm sound instead of to the Shelter. 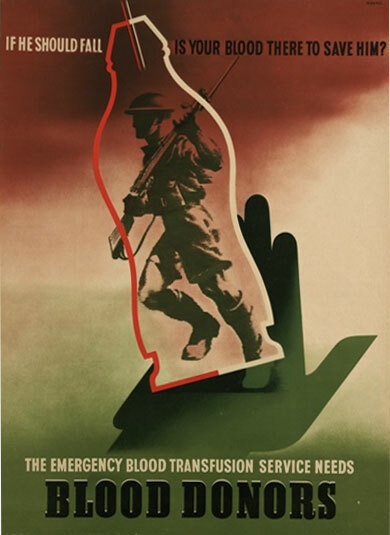 It was calculated that at least 60 would be needed but it was hoped that more would volunteer, as Josh Booth considered that - "Men would not want to be on this job for four years if the war lasts that long, so we want as many Watchers as possible so that we can change them round". The length of watch was limited to when there was an actual Air Raid in progress but Fire Watchers had to be on site for 12 hours, day and night. In Departments that did not work a Night Shift at the time it was intended to start a Night Shift so that the Fire Watchers - "Would have something to occupy their minds". 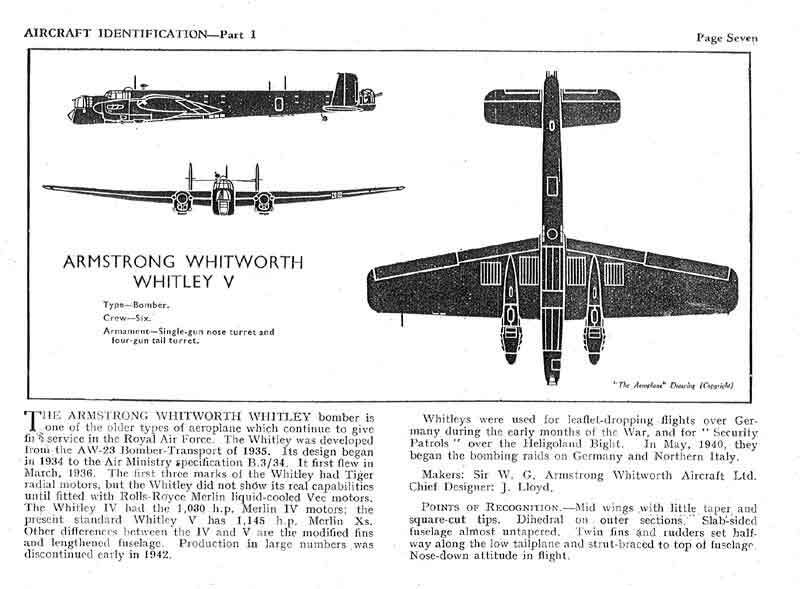 Roy Greenwood (ex - C+C Commercial Office)'s father-in-law, Cyril "Jimmy" Butler, was transferred from the Plate Shop to fire watching on Baker Perkins' roof early in the war and issued, on 17/12/1940, with a copy of the Ministry of Home Security's - "Silhouettes of British Aircraft". This was not, as it turned out, a good move as fire watching was not, like the Plate Shop, a reserved occupation and he was called up. However, he was soon back, discharged due to flat feet. "Jimmy" left Baker Perkins in 1945 to join what, in 1947, became British Railways. 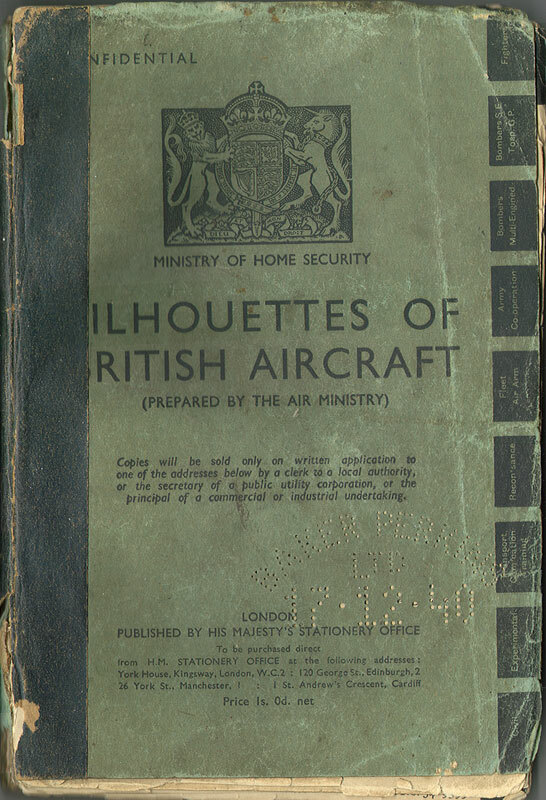 Cover and typical pages of the Ministry of Home Security's - "Silhouettes of British Aircraft" - issued to Fire Watchers at Baker Perkins in WW2. Fire watchers in some parts of the country were issued with a leather bag, leggings (to protect against poison gas) and steel helmet. It is not known whether these were issued to Westwood personnel. 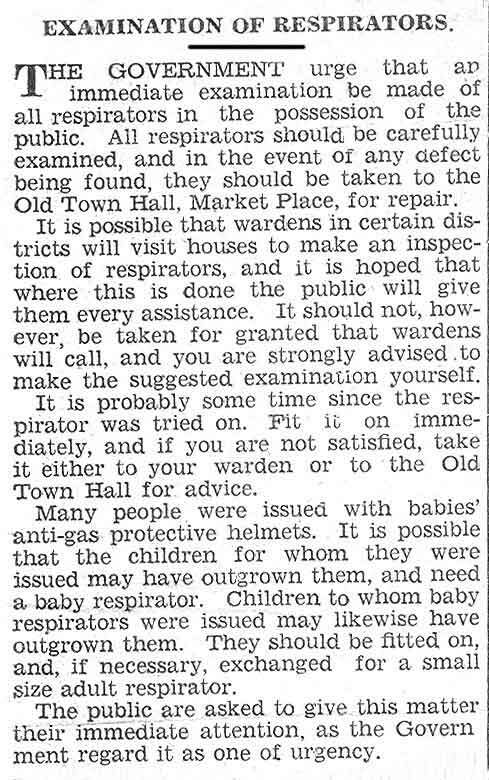 Evacuations had been practised satisfactorily but there was some fear that gasmasks, which it was compulsory for each person to carry at all times, might be damaged in the congestion around the clocking in/out stations at the beginning and end of shifts. The number and siting of these was to be reviewed. (See also Clocking-on). Any person approaching a post will be challenged - "HALT, WHO GOES THERE." The sentry must be perfectly certain that his challenge is given in the loudest possible manner - so that even those who may be dull of hearing can have the chance of responding - "FRIEND." If a person is challenged in this way does not halt, he will then be challenged again by the sentry - "HALT, OR I FIRE." If a person does not halt after this warning, he will be challenged once again in the same manner. If he does not halt, and if no means are available to stop him, it is then the duty of the sentry to use his rifle and shoot - aiming low to hit but not to kill. The sentry must remember that it is his duty to stop a person from advancing further should he fail to respond to the challenge and warning. If a person can be stopped in any other way, for example, by calling to the guard to assist, then the sentry will not shoot. The sentry must use his intelligence and sense of responsibility as to whether he will shoot or not. At night or in thick fog, a sentry must not allow himself to be rushed, and he must be well on the alert, more so than in daylight, and ready to take such action as is necessary to prevent any person who refuses to respond to his challenge and warning from approaching his sentry post further." Civil defence sirens (also colloquially referred to as air-raid sirens or tornado sirens) are used to provide emergency population warning of approaching danger and sometimes to indicate when the danger has passed. Initially designed to warn of air raids in World War II, they were adapted to warn of nuclear attack and of natural destructive weather patterns such as tornadoes or flooding..
During WW2, and for some time after, the multi-story office block in Westfield Road housed an air raid siren on top of the lift house. Inevitably, this device had to be serviced regularly and in the late 1960s this task fell to a newly qualified Apprentice Maintenance Electrician - Glyn Bartlett - who had joined Baker Perkins in September 1959. Glyn remembers - "I had learnt that the device was fired-up briefly at one o'clock on Monday lunchtimes. It was only when, for six months, I had the job of enabling this that I got the full story. A: To make sure it is working. Q: When would it be used? A: In the event of a nuclear attack. Q: But it wouldn't work. A: No. You would have to go and put the fuses in first. Q: Why don't I just leave the fuses in and it switched on all of the time? A: The wiring is getting a bit old and if there was a fault and it went off it might annoy people or frighten them. Q: Why don't we just put in new wiring? A: Just forget it. THEY want it just how it is. OK,Perhaps I was a lot naïve! Happy days." Glyn went on to become an Improver Draughtsman but left the company in 1966 to undertake teacher training. There were at least two sets of shelters - two underground shelters, located to the north of the Experimental Department and to the west of the Pattern Store, were quite long and dark and were used later by the Fire Brigade for training purposes. The shelters were filled with smoke and the firemen had to overcome a number of obstacles to get to the other end safely. The second set were located in the factory yard, on the right hand side facing north, approximately opposite the L70 office. Harold Holmes recalls that, during his time in the Plate Shop, a Shelter existed outside the north wall of the Plate Shop, on what was the coal/coke storage area. This was brick-built, with a concrete roof and was accessed via doors in the Plate Shop wall. There was also an escape hatch built into the concrete roof. This must have been demolished very soon after the cessation of hostilities to make way for the building of the new P4 Bay in 1946. "Under the present system ten men are employed on three shifts of eight hours - 3 men to a shift. 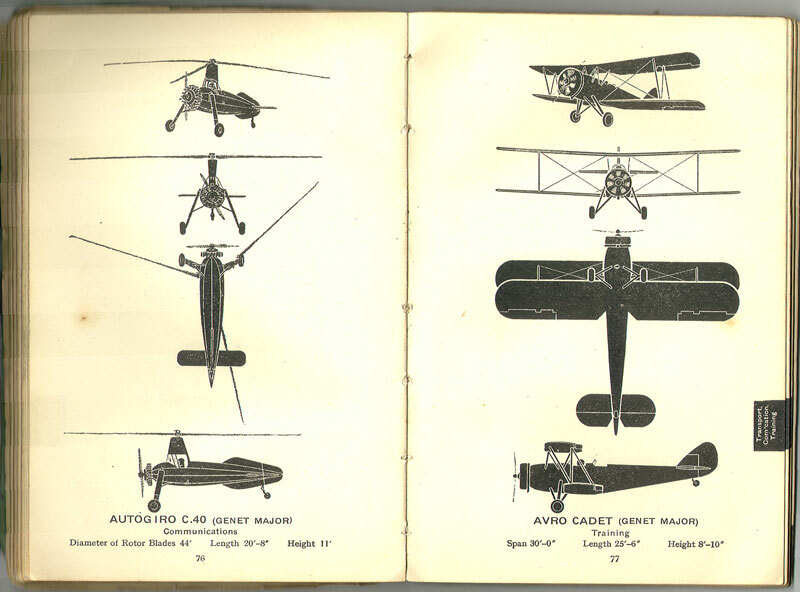 The reserve man is employed making model aircraft for instructional purposes, also on any other ARP job as occasion demands. Each shift consists of Nos. 1, 2 and 3. No. 1 acts as the observer in the look-out post. No. 2 attends to the telephones, makes up the log book and operates the Control Board. No. 3 patrols the roof and relieves Nos. 1 and 2 as and when necessary. All take turns in the various duties by mutual agreement. Experience during the past year has proved that the roof patrol is essential during blackout hours only. During daylight hours, except during "Alerts", there is a tendency for the No.3 patrol to spend a lot of time in the telephone room owing, possibly to the monotony of continually walking round the roof. Re-adjusting and replacing sandbags where necessary. The lighting of hurricane lamps before blackout and extinguishing them at the end of blackout, especially on Saturdays and Sundays when shelter attendants are not available. Any other duty that may be necessary, as the occasion arises. During "Alert" periods No. 3 would at once return to the roof, also relieve Nos. 1 and 2 as and when required. No.3 duties would be on a rota so that each man would have a break. The reserve man would also be employed on ARP duties as at present. During the holiday periods and when several spotters were ill last year, it was found that the raid spotting during daylight hours could be done very efficiently with 2 men on each daylight shift and 3 men on the blackout shift, which with one reserve made a total of eight men. I found that there was more harmonious working with two men on a shift who were fully employed than there can be with three men only partially employed". The experiences of the First World War led to a very real fear of enemy gas attacks and the Government decreed that everyone should carry a gasmask at all times. This law was strictly enforced regardless of age and occupation. "Anti Gas Precautions - All respirators should be regularly inspected and it should be ensured that all are in good condition and that defective respirators are promptly replaced as far as possible". A strongly worded instruction also appeared in the local press at the time. This requirement to carry respirators at all times caused the management other problems - see "Other Concerns" in "Preparations for War" above. 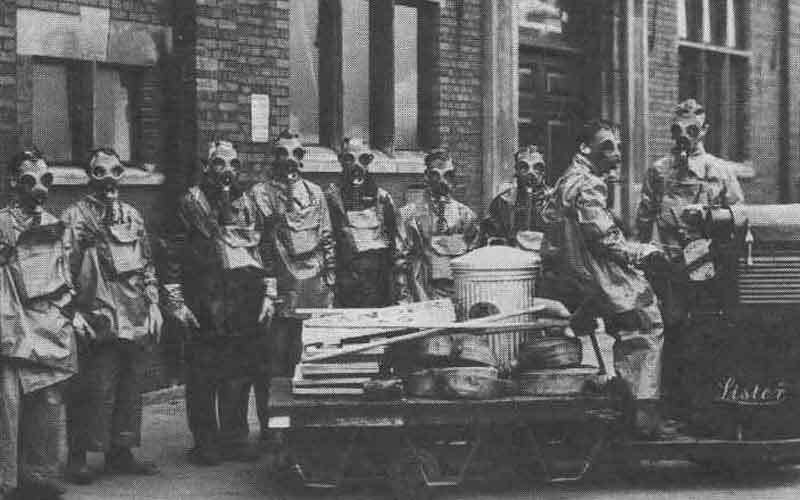 Gas Decontamination Teams, kitted out with gas-tight and waterproof protective clothing – and a badge – were organised to deal with any gas attacks. They were trained to decontaminate buildings, roads, rail and other material that had been contaminated by liquid or jelly gases using a lime slurry that was then washed off. Thankfully, although both sides in the conflict had stock-piled plentiful supplies of lethal gases, none was ever used. 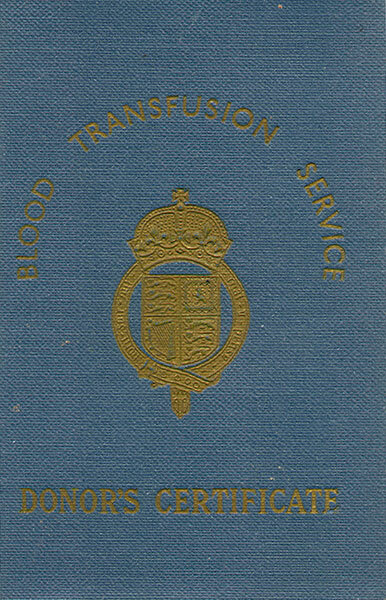 In line with the exhortations of their Country's Leader, workers in the factories, male and female alike, added "blood "to the "sweat and tears" that they were contributing to the war effort and joined the queue at the Blood Transfusion Service vehicle that made regular visits to factories across the country. 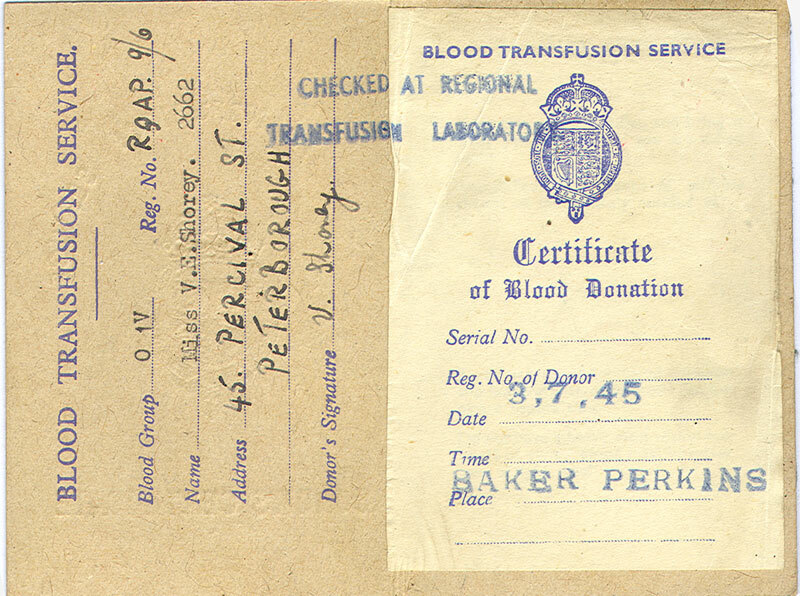 One such worker at Westwood Works was Miss Violet E. Shorey who worked in the Drawing Cabinet and whose Record of Blood Donation appears below.